Somewhere round the back of every custom shop is an unloved bike that’s been sitting there for months, waiting for its moment in the limelight. 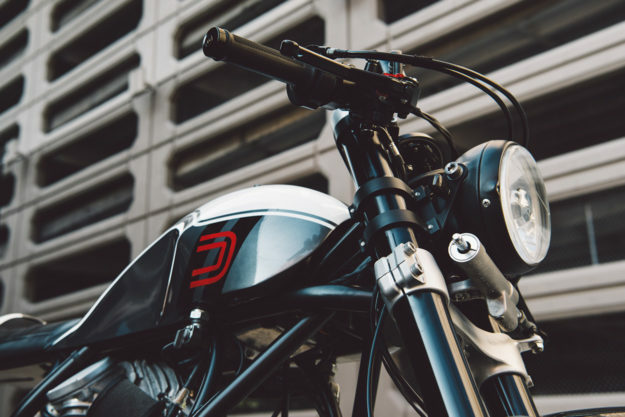 In the Atlanta, Georgia shop of Fuller Moto, the unloved bike was this classic Ducati. 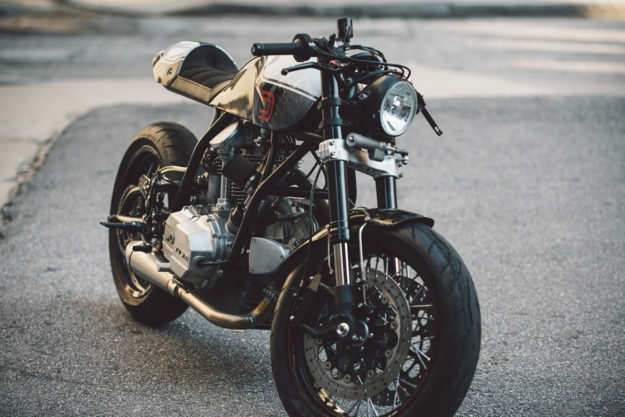 Of course, it didn’t look anything like the sleek cafe racer we see here. 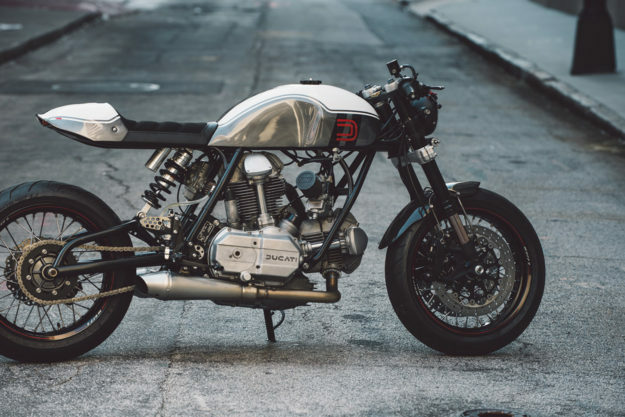 The Ducati’s savior was Bryan Heidt, a metal fabricator with a background in industrial design who has been working at Fuller for eight years now. Heidt decided to take the modern-but-classic theme up a notch. The stock Dell’Orto carburetors worked great, so those got to stay. The carbs and engine cases were then vapor-honed to make them better than new. The electronics were a different story. “The stock stator only put out 110 watts. 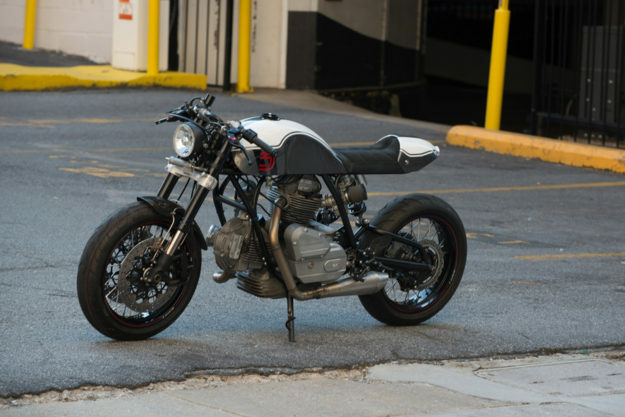 This wasn’t going to cut it with a new digital ignition, Motogadget m-Unit and Motoscope Pro gauges,” says Heidt. 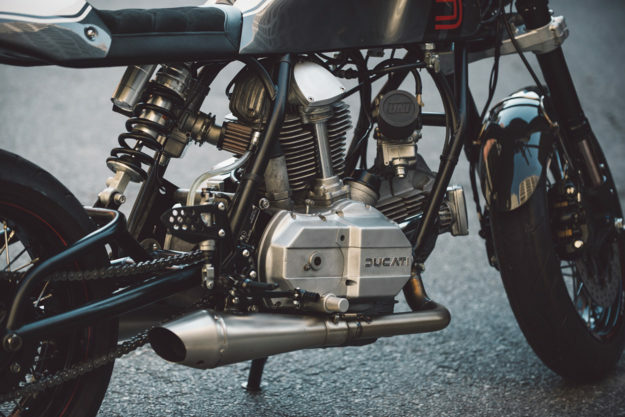 The 860 model was the first Ducati to come with an optional electric start—but the parts are insanely hard to find. 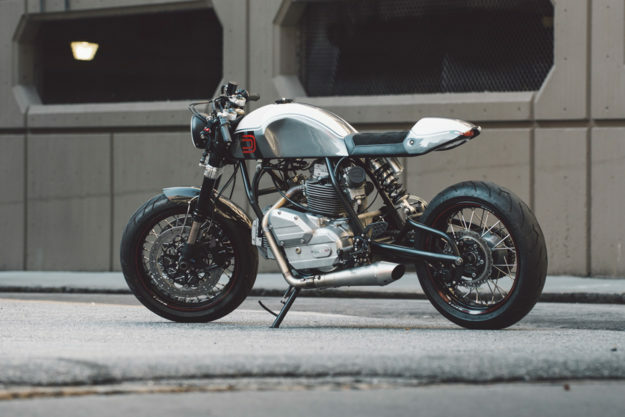 Heidt kept a constant watch on eBay for two years before he hit gold dust—just in time for him to make it to the Handbuilt show in Austin as an invited builder. He’s kept the front hub from the SportClassic wheel, but swapped the rear for a KLR650 item to beat chain clearance issues. Both hubs were then laced to lightweight SuperMoto rims and wrapped with Pirelli Diablo Rosso tires. 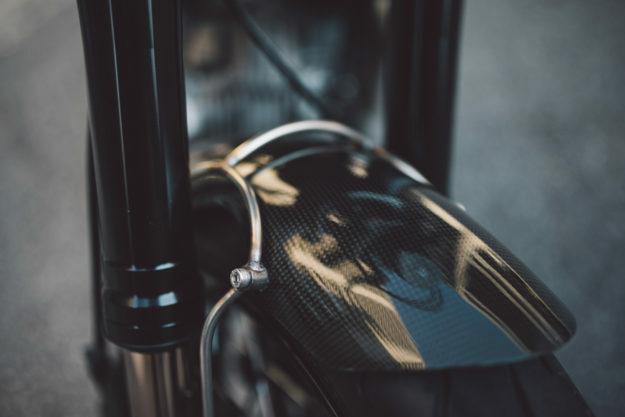 The front tire is covered by a cut-down carbon fiber fender from a Monster 800, and mounted using a fabricated stainless steel bracket. 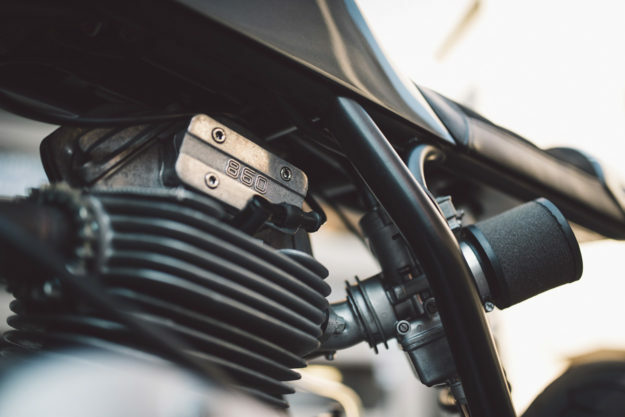 To match the clip-on handlebars from the GSX-R front end, the stock foot pegs were removed in favor of a pair of GSX-R rearsets—which puts the rider in a more performance-oriented position. The swingarm has been cleaned up and braced for the R6 mono-shock conversion, and the rear half of the frame is new. To top it off, there’s a custom aluminum seat pan covered by Love’s Trim in Hampton, Georgia. 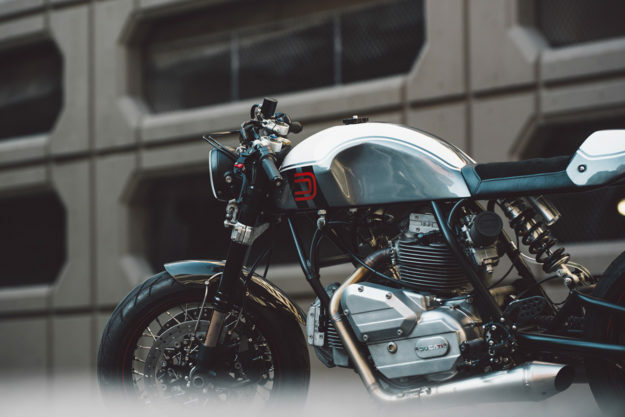 On a similar note, the stock Benelli tank had become extremely popular in the custom world, and would no longer set the bike apart. So Heidt cut out the sides and added some more dramatic lines. Joe Patterson at JDK expertly painted the tank and tail in a dark graphite Mercedes-Benz metallic. Heidt is a fan of pinstripes, but this bike didn’t call for swooping, pencil-thin lines of color. 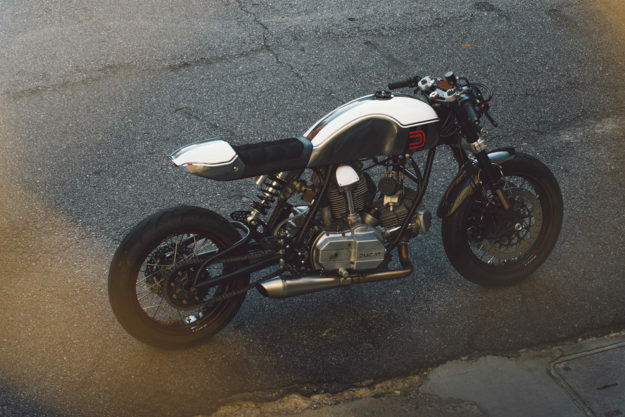 Instead, Chastin Brand added some small, detailed touches and a classic Ducati graphic—to give the paint an almost factory look. 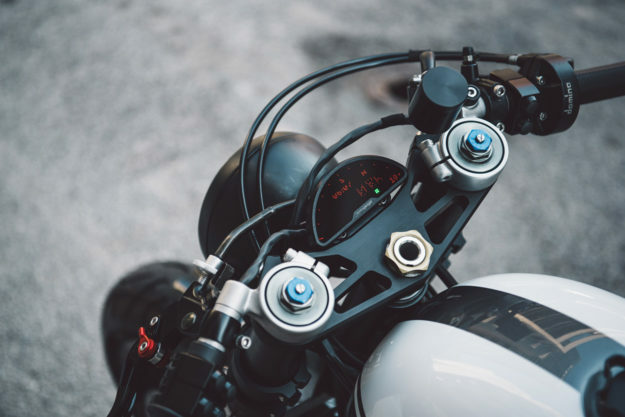 With updated electronics and finely tuned carburetors (“thanks to my good buddy Wes!”), the bike fires up the instant you press the Motogadget M-switch. 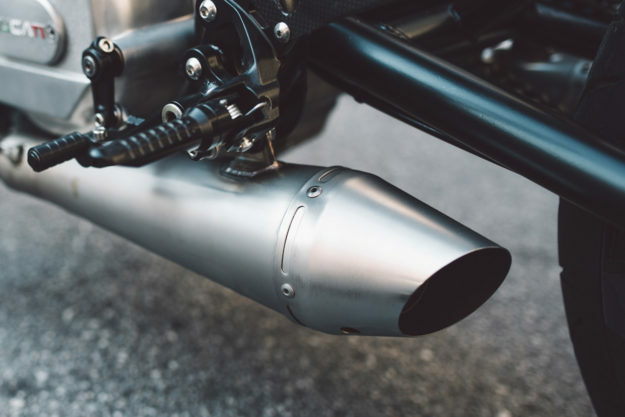 The exhaust rumbles through custom stainless pipes and a pair of reverse megaphone mufflers. After its debut at the Barber Vintage festival, the bike is now heading down to Desmo Pro for Rich to rebuild the motor with high compression pistons and a port and polish. Those modifications should boost the old girl from 65 to around 80 horsepower—giving plenty of grunt for a machine substantially lighter than stock. 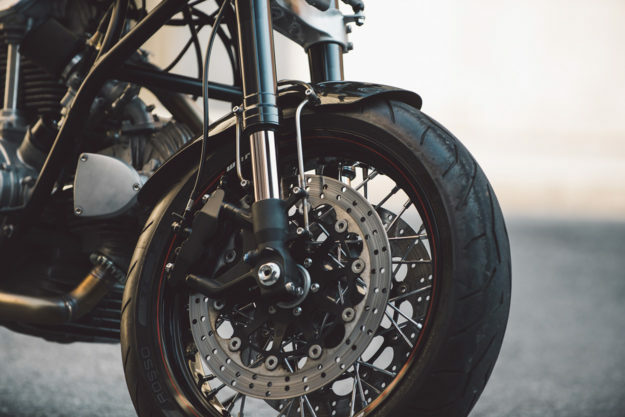 The inverted race forks and rear shock allow the rider to hug corners like the Ducati designers could have only dreamed of 40 years ago. And to cope with the newfound acceleration, radial calipers and 320mm rotors provide ample amounts of stopping power. That doesn’t mean the Ducati will be wrapped in cotton wool, though. “For now, this is my personal benchmark, and I couldn’t be more proud of it. But high scores and lap records are meant to be broken,” says Heidt.